Learn how to structure your bids for the most optimized bidding strategy. In addition to your ad group's default bid, you can place custom bids on specific sites, apps, and channels. This allows you to structure your bids in a hierarchy from broad (ad group default bid) to specific (sites and apps). 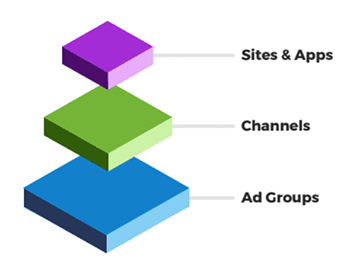 TIP: Broadly bid on each ad group, then fine-tune your bids more granularly as you learn how specific sites, apps, and channels perform for your campaign. Bids on more specific levels take priority. For example, if your ad group has a $.15 default CPC bid and you've placed a $.20 custom bid on Channel N310 and a $.18 custom bid on site-12345, you'd pay a $.18 CPC if a user clicks your ad on site-12345 when Channel N310 serves the impression. In this same example, if you did not place a custom bid on site-12345, you would pay the $.20 CPC bid placed on Channel N310. If neither the channel nor the site or app has a custom bid, the ad group's default bid will be applied. 2. In the Suggested Bid column on the Channels tab within an ad group. NOTE: If a channel's bid is higher or the same amount as the Suggested Bid, a Suggested Bid will not be shown. When you haven't customized a bid for an app, site, or channel, the ad group's default bid will be shown in gray. If you have customized an app, site, or channel's bid, the custom bid will be shown in blue. To customize a bid, click the bid amount to render it editable, enter a new bid, then click the checkmark to apply the change. To remove a custom bid and revert to the ad group's default bid, click the bid, then click the "x" in the bid amount field to clear the field, then click the checkmark to apply the change.